... as I cast my mind back into my murky past I do not remember ever really enjoying "manufactured" fruit cake (and Christmas cake is basically a fruit cake). I think the part of the cake is not the cake but a specific fruit..... that basically makes me gag.... it is the candied Citron, and you find it in a majority of American fruit cakes. I did however adore my Granny's "fruit cake." She made it once a year and it was a family tradition that passed when she did. Here "fruit cake" was mostly cherries, pecans and whiskey with a little candied lemon and orange peel - without a hint of citron - so I figure if I left out that detestable citron - the cake I make would be safe. I really enjoy a heavy cake, I also enjoy dried fruits, booze, nuts and spicy things so why not try my hand at this cake? I didn't have a recipe for this cake and so I started looking for one on the web - and find that there seems to be dozens of variations to the recipe out there for these lovely cakes. All different amounts of ingredients and all sorts of fruits.... I've pulled together some of the more interesting recipes and sort of made up my own - and I've be tweaking it to include a wider variety of fruits and nuts - like cranberries, pineapple, pecans and walnuts. ......get those fruits soaking and spoons ready!! That's about it for today sports fans, thanks for stopping by do stop again!! Yummy yum! Will you add the fondant outer layer as shown? That sounds heavenly. A friend sent me a homemade fruitcake last year and for the first time ever I realized that fruitcake CAN be delicious. Good luck Edgar. I hope you find a cake that makes you happy! Interesting! I hate fruitcake and make small Bishop Breads for gifts. And a few for me! 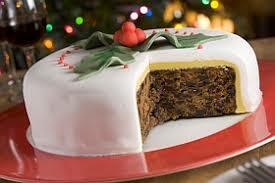 All my ingredients are ready for my cake, although a love a good fruit cake any time of the year. I love making fruitcake and also detest citron. I have been using King Arthur Flour's fruitcake blend fruit and candied cherries for years. Lots of yummy fruit and none of the nasty stuff. Looking forward to seeing your finished product. I will be curious to see how your fruit cake turns out. I have been thinking this last month about how I once had a good fruitcake and needed one again! This is a fabulous idea, and I am eating with bated breath for your developments and results! *that should have been waiting with bated breath. Darned auto-correct! Dearest Edgar: I am one who likes fruit cake, but only the expensive ones and like to warm it up a little not much it gets dry otherwise. A latte and warm fruit cake yummy. The cake you are showing looks very good.